Along with the double-height dining room and kitchen on the ground floor, the firm also added a master bedroom, yoga area and balcony to the first floor. These areas receive plenty of natural light from the new floor-to-ceiling windows that open towards the back garden – the architects have also created outdoor dining area here with steps down to a pool. On the top level, the master suite occupies the back of the home, and can be closed off from the stair with a pocket door. The owners have access to a balcony that overlooks the garden. Two additional bedrooms are located at the front of the house on the top floor facing the street. Naturehumaine also added another small office on this level, so both homeowners can work from home. 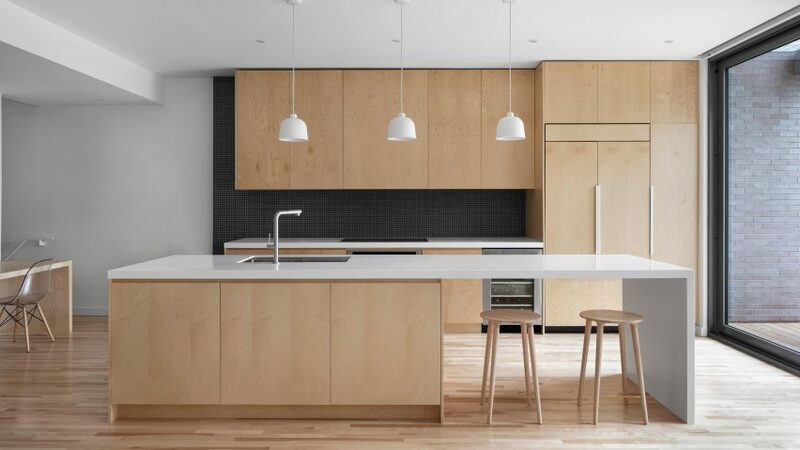 Naturehumaine was founded in 2004 by Stéphane Rasselet and Marc-André Plasse and has completed a number of renovations to homes in Montreal. Other examples include a duplex in the city that now features a staircase enveloped by black rods, a home that was enlivened by a plant-covered wall, and a prairie-style suburban property that was given new life.